The PR office of O:TU Wine has been trying to organising a tasting between me and their winemaker Jan Kux on and off for a year, and we finally met just a few weeks ago. At first, I thought Jan was just another high-flying businessman turned winemaker who preferred to spend more time in Europe and therefore had to use a PR office to organise his meetings. Our conversation changed my impression. Yes, winemaking was a second thought for Jan—he studied law and languages originally before deciding to switch to winemaking. Since then, he has accumulated over 20 years experience working in wineries in Germany, Alsace and Bordeaux, to name a few. Apart from running O:TU, he is also a consultant to several wineries in Europe. A jet-setter he may be, but Jan is certainly not pretentious. Otuwhero Estates, the former O:TU, went into receivership in 2008 and the new owners went to Jan seeking help reviving the business. Apart from making the wine, he is also hands on with the selling and marketing side. While he respects terroir—we did talk about the different kind of soils in the 200ha vineyard—he believes even more in communicating with customers. The packaging has to strike a chord with the target audience and at the same time reflect the wine. The result is a bold yet understated label, a combination of classic European and modern styling. Jan makes three Sauvignon Blancs, each with a defined market. 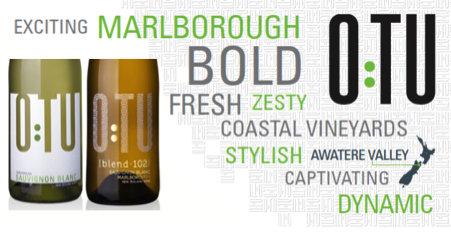 O:TU Sauvignon Blanc, with vibrant green lettering on the label, is created with the young woman in mind, light and refreshing with a touch of residual sugar, while the more complex blend:102 with riper fruit and warmer-toned packaging is aimed at the more experienced consumer. The latest blend: 202, still in barrel at the moment, is a robust, food-friendly wine and no doubt will have a label to match. But O:TU is about more than labels. A striking label may help sell a wine once, but if you want repeat purchases it needs quality to back it up. O:TU certainly has the typical Marlborough tropical fruit aromas, but all the wines are aged on fine lees until bottling, giving that extra mouthfeel and complexity to subdue the pungency and add a touch of Old World character. Some wine professionals dismiss packaging, averring that consumers should judge a wine solely by its content. However, with thousands of brands around, having both the label and the quality can give the edge. Jan’s winemaking philosophy is about beauty, art, culture and appreciation of nature combined with a scientific approach. I couldn't agree more with this. 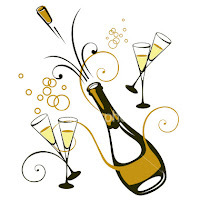 It’s that time of the year again when sales of bubbly are traditionally at their highest. Despite the doom and gloom of the economy, people, especially wine lovers, do like to indulge. However, enjoying bubbly does not need to break the bank. There are plenty of good quality sparkling wines outside Champagne that one can enjoy all year round. Champagne is expensive for a few reasons. The first is production. Secondary fermentation, where the bubbles are created (called the Traditional Method), occurs in the same bottle. The wine is then aged on lees, a procedure called yeast autolysis, to develop the bready and biscuity notes. The longer this period is, the more pronounced the yeast autolysis characters. By law, non-vintage champagne has to be aged on lees for a minimum of 12 months and vintage champagne for at least 36 months (and often much longer). The second reason is climate. Champagne is in a marginal grape growing area where grapes, when fully ripen, can still retain high acidity—a prerequisite for good sparkling wine. And last but not least is marketing. Only sparkling wine produced within the Champagne region can be called Champagne, and this helps build the aura of exclusivity around it. A lot of sparkling wine outside Champagne is produced using the same Traditional Method but only costs a fraction of the price. Admittedly, a fine Champagne often has more finesse because of the marginal climate, complex blending and use of reserve wine, that set it apart from the rest, but one should not dismiss the other sparklers as lesser quality. Crémant is another French sparkling wine outside Champagne. It is made by the traditional method, using whole bunch pressing with extraction limited to 100litres of juice from 150 kilograms of grapes—exactly the same stringent approach as in Champagne. The wine has to spend a minimum of nine months on lees and the grapes are generally the best from the region for making still wine (the permitted grapes for Champagne are Chardonnay, Pinot Meunier and Pinot Noir). Crémant de Loire is usually made from Chenin Blanc, or Pinot Noir; Crémant d’Alsace from Pinot Blanc, Pinot Gris, Pinot Noir and sometimes Riesling; Crémant Limoux, from the high altitude of Southern Languedoc, is made from Chenin Blanc and Chardonnay. Retail prices of Crémants are in the region of HK$200/bottle. Most of us know Cava, a sparkling wine from Spain made in the traditional method with a minimum of nine months ageing on lees. Most Cava uses the indigenous grape varieties Xarel-lo, Parellada and Macabeo for whites, and Garnacha (Grenache) and Monastrel for rosés. Chardonnay and Pinot Noir are also permitted. Cava has distinctive earthy notes (some say rubbery) because of the Xarel-lo. Most Cava is not for ageing, hence its modest price of just over HK$100/bottle. Segura Viudas Reserva Heredad, with up to four years on lees, is a steal at less than HK$200/bottle (Watson’s). The New World, including Australia, New Zealand and the US, also produce good quality sparkling wine using Champagne grape varieties in the traditional method. The best comes from cooler regions of Tasmania, the Adelaide Hills, Marlborough and Carneros, all displaying riper fruit characters but a less defined structure than Champagne, but there are nevertheless some top quality New World sparkling wines that can rival Champagne. Cap Classique from South Africa uses mainly Chardonnay, Pinot Noir and Chenin Blanc following the ‘champagne’ method. Serious Cap Classique producers are members of the Cap Classique Association and some are available in Hong Kong. And for something out of the mainstream, try Casa Valduga from Brazil (importer Wine Patio). In my view, the two outstanding sparkling wines outside Champagne are English sparkling wine and Franciacorta DOCG from Italy. Both have the elegance and finesse of Champagne. Southern England has similar soil (chalk) to Champagne and climate change now enables England to ripen Champagne varieties reliably to make top quality sparkling wine. English sparkling wines are scooping awards in international competitions and have beaten Champagne in various blind tastings. The problem is quantity, as demand is outstripping supply. The few I have tried and like are Ridgeview and Camel Valley, both available in Hong Kong, plus Nyetimber and Bluebell (not yet in Hong Kong). Franciacorta, made with Chardonnay, Pinot Noir and Pinot Bianco, must be aged on lees for a minimum of 24 months for non-vintage and 36 months for vintage. Sparkling wine can also be produced using the Charmat or Tank method, meaning secondary fermentation takes place in a pressurised tank rather than in bottle. Charmat method wine usually spends no or minimum time on lees so production cost is considerably reduced. This method is particularly suitable for aromatic grape varieties where wine reflects the varietal aromas rather then the yeast autolysis characters. These wines should be consumed young and fresh. The most popular in Hong Kong is the Italian Prosecco with fresh aromas of apple and melon. Priced at about HK$100+/bottle, it is definitely value for money, particularly the DOCG which is of better quality. Another is German Sekt, the best being made from Riesling, although some serious producers make it using the traditional method. The rising stars among sparklers are Asti and Moscato d’Asti from Italy with only one fermentation. They are highly aromatic with lower alcohol (7-7.5% and 5%), medium sweetness and less pressure, popular among young consumers. With so many choices and reasonable prices, bubblies do not need to be saved for celebrations only. Enjoy one now.